SHANGHAI – China's rising star Ik Yang captured the WBO Asia Pacific Lightweight Title by knocking out scrappy Thai Sukkasem Kietyongyuth in the 8th round Tuesday night at the ultra-modern Mercedez-Benz Arena at the Pudong disctrict here in front of a raucous Chinese crowd that cheered Yang's every punch. The heavy-handed Yang, with an undefeated record of 17 wins with 12 knockouts, floored Kietyongyuth (13-3-0) right in the first round but the game Thai came back to score potshots of his own against the flat-footed Chinese. 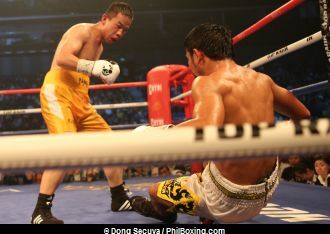 However it was clear that Yang landed the more damaging blows in the course of the fight. 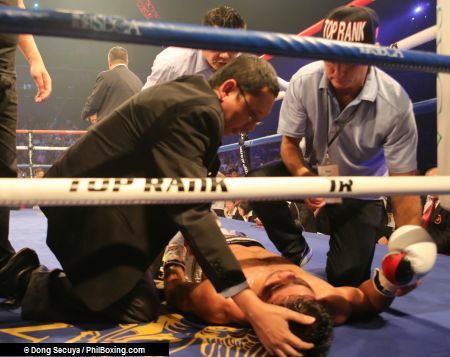 In the 8th round, Yang connected with a devastating blow to take out Kietyongyuth for good as the hapless Thai remained in the canvas for several minutes being helped by the ringside medical team. Ik Yang will now move on to fight in the undercard of the huge Pacquiao-Algieri boxing card on Nov. 23 in Macau. In the main event of the night, the Philippines' Randy Petalcorin captured the WBA Interim junior flyweight titlte by knocking out Walter Tello in the 7th round. Click here for the complete story. Qu Peng, China (6-0-1, 4KO) won by TKO in 3 against Marlon Alta, General Santos, PH (12-5, 9KO) in their 4 rounds Light Heavyweight bout. Zhou Yun Fei, China (3-0, 3KO) won by 6th round TKO over Marcos Amado, Australia (4-2, 2KO) in their 6 rounds Super Middleweight bout. Xu Que, China (0-1-1, 0KO) drew his bout with Liu Yongcai, Wuhan, China (1-0-2, 1KO) , 4 rounds featherweight bout. Halimubieke, China won by unanimous decision over Phompetch TwinGym, Bangkok, Thailand in their 4-round lightweight bout. Ma Yi Ming, Da Lian, China won over Morakote PatanakanGym, Bangkok Thailand in their 4-round flyweight bout.